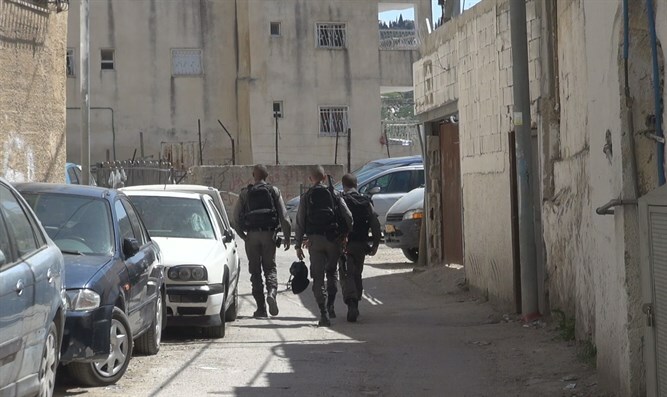 Forces arrest in Silwan PA official involved in kidnapping of Arab resident of J'lem whom PA suspects facilitated real estate sale to Jews. Border Police and the Jerusalem Police last night arrived at the neighborhood of Silwan in eastern Jerusalem to arrest Adnan Gheith, the Palestinian Authority’s so-called “Jerusalem governor,” who lives there. Gheith's name was recently mentioned in the media and at a special session held in the Knesset as being involved in the Palestinian Authority’s arrest of Issam Akel, an Arab resident of Israel who was involved in real estate transactions with Jews. In the Knesset debate, MKs demanded that Israel demonstrate its sovereignty over Jerusalem and not allow the continued erosion of this sovereignty by the PA. They also mentioned the testimonies of Palestinian Arabs who were arrested and tortured by PA mechanisms in the past for similar real estate transactions. The Lech Yerushalayim organization, which monitors the events in the eastern part of the capital and reported on the arrest, said that "the activities of the Palestinian Authority in Jerusalem must stop." Maor Tzemach, the organization's chairman, added, "Israel must fight a war against the activity of the PA in general and Adnan Gheith in particular, in light of the kidnapping of Issam Akel and the direct responsibility of Adnan Gheith in the affair."